Attorneys at the law firm of Vannoy, Colvard, Triplett & Vannoy, PLLC have been providing clients in Wilkesboro and northwestern North Carolina with professional legal services for civil and criminal law matters since 1968. Today, our law firm continues this tradition and remains as committed as ever to meeting the broadest possible range of legal needs by providing knowledgeable advice and effective representation for individuals, businesses, organizations and local government entities alike. On the civil law side, our practice includes personal injury claims, workers’ compensation claims, Social Security Disability claims, real estate transactional services, estate planning and probate services, family law and divorce-related services, business law services, and dispute resolution services through negotiation, mediation or civil litigation. On the criminal and traffic law side, we handle all types of traffic citations and can effectively defend individuals who have been accused of anything from simple misdemeanors to homicide. Vannoy, Colvard, Triplett & Vannoy, PLLC attorneys support and actively participate in numerous local government, charitable and civic organizations, serving and continuing to serve on the board of directors of such groups. Our law firm’s attorneys provide counsel to Wilkes County and the town of North Wilkesboro as well. Simply stated, our attorneys, all of whom are from the Wilkes County area, and our support staff have the experience and resources necessary to provide you with the peace of mind and dedicated representation you deserve. We have developed a reputation for personal service and passionate representation. 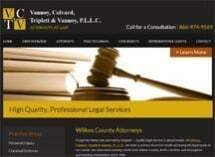 Please contact us if our firm can be of assistance to you or your family. East Coast Millwork Distributors, Inc.
Suncrest Farms Country Hams, Inc.
1st Citizens Bank & Trust Co.
Vannoy, Colvard, Triplett & Vannoy, P.L.L.C., have been providing professional legal services in Wilkes County and northwestern North Carolina since 1968. Vannoy, Colvard, Triplett & Vannoy, P.L.L.C., offers decades of personal injury trial experience in Wilkes County or the surrounding portions of northwestern North Carolina. Vannoy, Colvard, Triplett & Vannoy, P.L.L.C., understands what is at stake for you right now. They have a great deal of criminal trial experience in District Court, and in jury trials in Superior Court. Vannoy, Colvard, Triplett & Vannoy, P.L.L.C. 's helps clients with divorce, domestic violence restraining orders, prenuptial agreements, paternity, terminations of parental rights and adoption. Vannoy, Colvard, Triplett & Vannoy, P.L.L.C. provides businesses in northwestern North Carolina with a full range of quality, professional legal services for everything from startup to dissolution.